new info at the bottom of the post! A few weeks ago, the Chicago Tribune posted a few 1930s-era photos of the H.H. Holmes murder castle from their archives online. All of them have circulated before, but never in nearly such great quality, or, in some cases, uncropped. I’ve seen the photo of the stove and tile floor still in place as of the 1930s, but never the version with the man standing off to the side. The exact date of the middle photos is hard to determine. The first was certainly taken in 1895 (it remains the only photo of the version of the castle Holmes knew; the top two floors were torn down and replaced late that year, after a fire damaged them), and the fourth is presumablyfrom January, 1938, when it ran with an item saying the castle was slated to be razed. The middle two are trickier to date. The exterior shot ran in a March, 1937 retelling of the Holmes story, and the “stove” shot has circulated, but I’m not sure it ever ran in the paper. When it was taken, exactly, is more of a mystery. 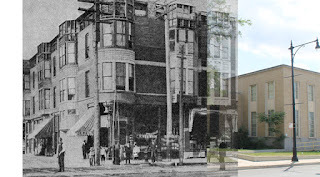 In it, we can clearly see that the sign store on the site of Holmes’ old drug store was Spatz Sign Shop. The later shot has the name crossed out, and a sign saying they’d moved down the block to 520 W 63rd. 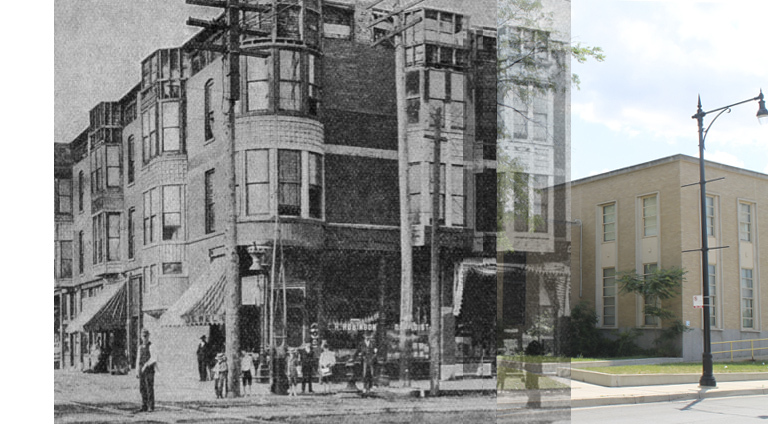 However, according to the local Southtown Economist, they moved to that spot in 1930. Could the shots be from before that? The exact time frame in which the sign shop operated in the castle has been a bit confusing, but in researching it, I came upon another mystery. such a stove would not have been possible. The man in the shot is presumably B.H. 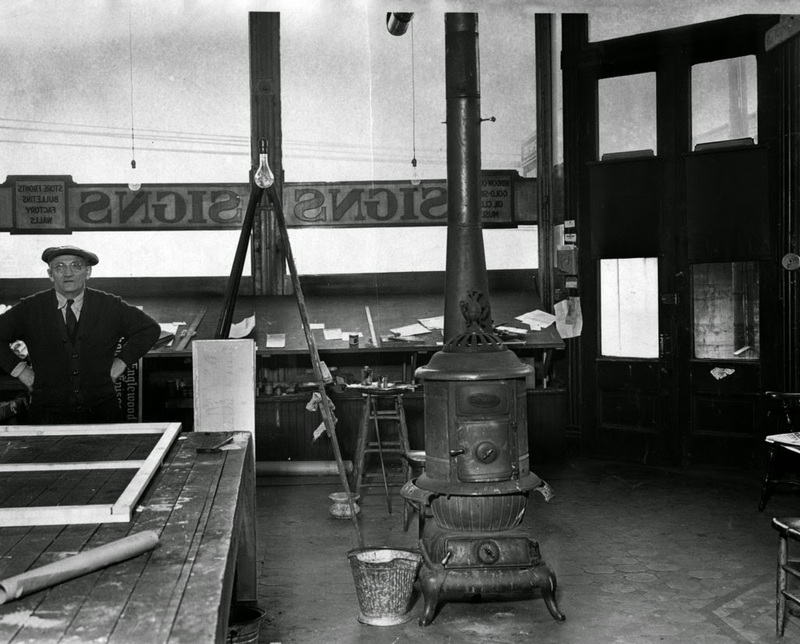 Spatz, who ran the sign shop until his death in 1939 (at which point his wife, Bess, took over). Bennet Spatz (the middle name was likely Hugo, his mother’s maiden name) appears in plenty of census records, but appears in papers only a couple of times, always related to another mystery: in 1922, his daughter was kidnapped. Though the story only appears in bits and pieces in scattered articles, it seems that in 1922, his 13-or-14-year-old daughter, Maxine, was kidnapped and held for eight days in the Plaza Hotel at 24 West Huron. 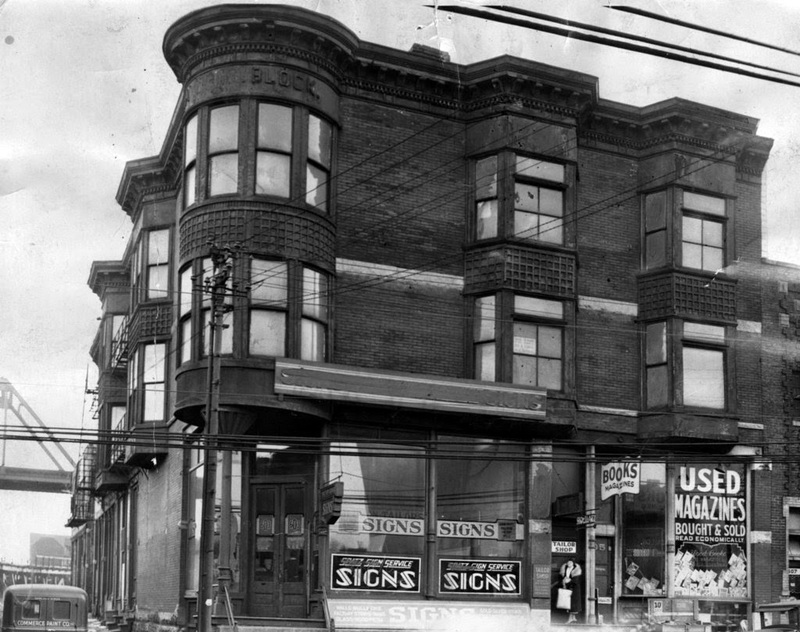 After being rescued by the police, she was preparing to testify against a group of five people involved in August of 1922, when she and a couple of neighbors said they’d seen a couple of the group loitering around the neighborhood. On August 20th, Maxine left her home near 61st and Halsted to run an errand, and never returned. Papers assumed she’d been kidnapped again by the people against whom she was planning to testify. The story was next mentioned in November, when it was said that her mother was doubling her efforts to find her, but that was the last Chicagoans at large ever heard about Maxine Spatz. This could turn into a whole other rabbit hole of research. Connecting her to Holmes simply because her father worked in a shop in the castle (possibly long after she vanished) is shaky, but when I was working on the ebook about the “Holmes curse“, I found newspapers in the late 19th and early 20th century calling people victims of the curse for a whole lot less. She remembers her great grandmother, Bessie, would often point out many of the signs around the neighborhood that had been painted in Spatz’s Sign Shop (she survived him by several decades, dying in 1972; he was a veteran of the Spanish American war, and she was still collecting benefits at the time of her death). The fact that it had been Holmes’s old place was not unknown to the family. However, the family never spoke of Maxine’s kidnapping, so the story there is still bit of a mystery. Over the winter I went on a quest to catalog and document ALL of the HH Holmes sources I could find here in town that weren’t available online – lawsuit records, defunct Chicago papers, etc. 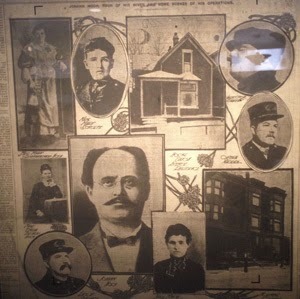 The best of the Chicago papers constitute the best primary sources we have on the Chicago angle of the case, and much of the info there is widely unknown in Holmes circles. The stories one usually hears about him come more from 1890s tabloids and (especially) 1940s pulps. One story that came up in a few Chicago papers has puzzled me some: the story of John DeBrueil, the man who died in the “Holmes castle” in full view of several witnesses. 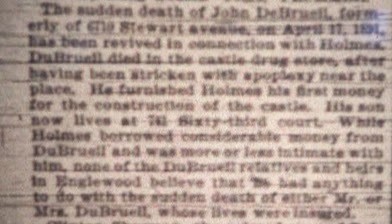 On August 1st, 1895, when Holmes stories were just starting to fall off the front page of most papers, the Chicago Times Herald, mentioned that the recent investigations at the castle had sparked renewed interest in the story of a John DeBrueil, who died in the “castle” drug store on April 17, 1891, after “having been stricken with apoplexy” near the place. In 1890s talk, this usually just meant that he had suddenly collapsed and died. According to the Herald, DuBruell had furnished Holmes with the first chunk of money to build the place (which, at the time, was probably only two stories; he borrowed three grand from Dr. MB Lawrence to expand). Though bumping people off because he owed them money wasn’t out of line for Holmes, he was not considered a suspect here; the Herald said that “While Holmes borroed considerable money from DuBruell….none of the DuBruell relatives and heirs in Englewood believe that (Holmes) had anything to with the sudden death of either Mr. Mrs. DuBrueil, whose lives were insured. The Times Herald may have told a slightly longer version of this a week or so before, when they spoke to a man named Ben Nixon who had worked in the castle’s jewelry store. He recalled the one day “a man stepped from a suburban train..and fell in front of Holmes’ store in some kind of a fit. Holmes poured a dark liquid down his throat and the man died. He lived in the neighborhood.” Nixon thought it was suspicious, and wondered at the time if the man had been insured. “Holmes was regarded even then as a fellow who would do anything for money.” This sounds like the same story as above. From genealogy sites I do see that a Canada-born man named “John L. Dubreuil” died April 18, 1891 in Chicago at the age of 68, but the death certificate doesn’t seem to be scanned. He was buried in Thornton, a small town on the far south side of the Chicago metro area. Presumably, he’s the same John Dubreuil from Canada was living as a farmer in Lyon (a west suburb) in the 1860 census with three people named Bouchard, and the one who was living in Indiana during the Civil War draft a few years later. He married his wife, Elizabeth, in 1876 in Englewood. She was ten years his junior. 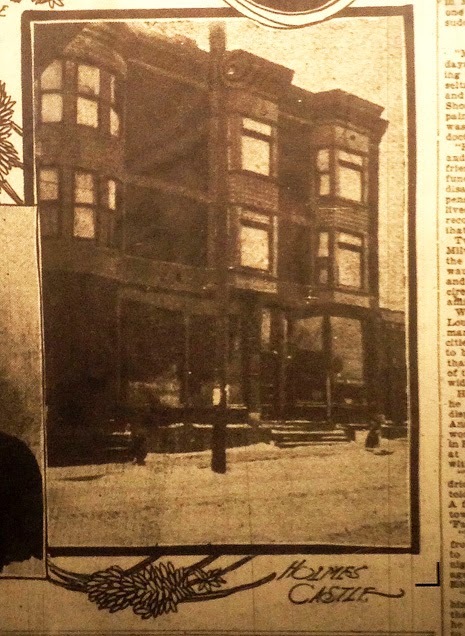 Though his death doesn’t seem to have made the Tribune, there is an article from 1894 in the Trib talking about the bitter fight over the DuBrueil estate. According to the artcile, Elizabeth had died in September, 1892, leaving an estate valued at half a million bucks – there was a movement in place to remove Eddie DuBrueil, a son who was living in Englewood, from his position as executor of the estate. That Holmes would try to kill a person with that kind of money, with the intention of getting it for himself, seems reasonable enough. That Holmes was after people’s life insurance money is pretty well known, though he wasn’t as good at it is he’s often made out to be. It’s commonly said that he was good at talking people into buying insurance and making him the benefactor, but primary sources really only indicate that he tried to do this a lot. No one seems to have been dumb enough to fall for it. Ben Pietzel came the closest, in that he bought a huge policy, but Holmes wasn’t the benefactor; he got the loot by swindling the widow. This may well have been Holmes’ plan here: he’d kill off the guy, make his widow rich off the insurance (though they must have been well off already; I don’t think got half a million in insurance back then, when Ben Pietzel’s 10k plan was pretty remarkable), then seduce or kill her and get the money for himself. But no one close to the case seems to have suspected it much at the time, so it may just be wild speculation. If they’d had any reason to go after Holmes for money still owed as of 1895, they probably would have done it. The basic facts don’t all add up to murder here – Holmes pouring a dark liquid down the guy’s throat sounds awfully suspicious, but the idea that he could have arranged for him to collapse right in the store, right after stepping off the train, seems a bit less plausible. Maybe he just saw an opportunity and went for it? I couldn’t find any info on how Mrs. DuBrueil died, and I haven’t checked the defunct papers from the dates around John’s death to see if it was reported at the time, or if anyone seemed supsicious at the time. This would have been months before Julia Conner became the first person to disappear from the castle, but Holmes DOES seem to have been thought of as a swindler, at the very least. The lawsuit over the estate seems to have been based in Crown Point, Indiana, so it’d be tough for me to see how the whole thing turned out, but they still had all of the money as of Oct, 1894, by which point Holmes was out of town, so if he killed John DuBrueil to get his cash, he seems to have failed! 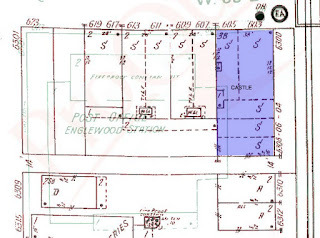 William DuBrueil, John’s son, seems to have inherited any interest in the property; his name starts showing in up Cook County Recorder notes about the property after his father’s death. The story is mentioned in our new expanded Murder Castle ebook, along with much of the rest of the stuff I found over the winter. Murder Castle of HH Holmes Ebook EXPANDED! Our first ebook, THE MURDER CASTLE OF HH HOLMES, has now been expanded to a FULL LENGTH book. 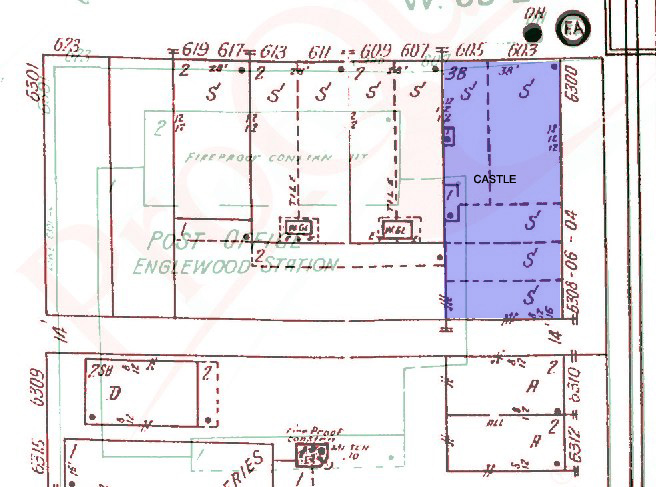 Re-organized with tons of new info, new diagrams, and more to tell a more complete picture of the famous “castle” through eyewitness accounts from people lived and worked in the building. Now over 55,000 words to tell you everything down to the combination to the soundproof vault! – Dozens of first-hand accounts about life in and around the castle, both during Holmes’ time there and during the 1895 investigation. 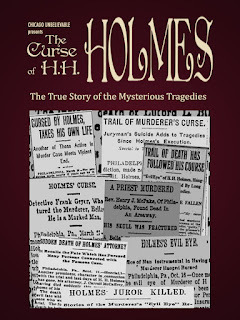 – Detailed information about seldom-heard stories about Holmes, including his near-gunfight with a neighbor, the man who died in the castle drugstore, and many more. – In-depth background info, contextual information and analysis about each source, as well as info on the relatives merits of the many Chicago newspapers of the 1890s. 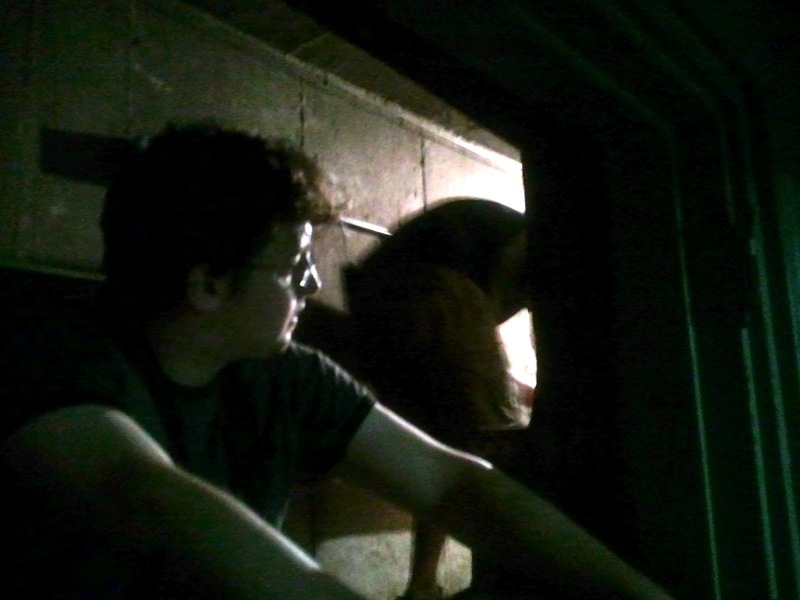 – Adam’s report on the basement of the post office that stands on a portion of the grounds where the castle once stood. So, wanna know what’s in the book? Take a look at the table of contents. Each chapter comes with background information and contextual data. The Deadly Stove: The Investigation Begins. Was the Castle About to be a Museum? Don’t have a kindle? No problem! Get a FREE Kindle App for Your Smartphone, Tablet, or PC! 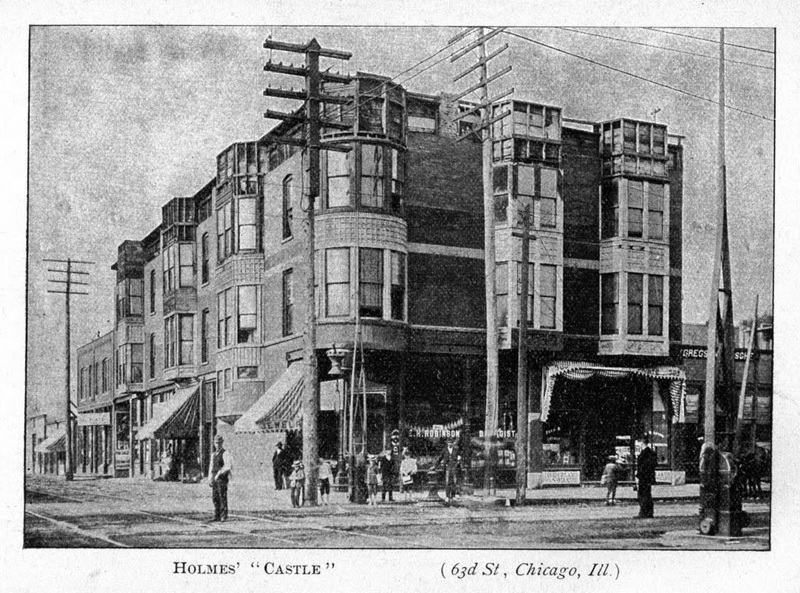 “The Holmes Castle” was a well-known building in Englewood well into the 20th century; contrary to popular belief, the 1895 fire did not burn it to the ground. 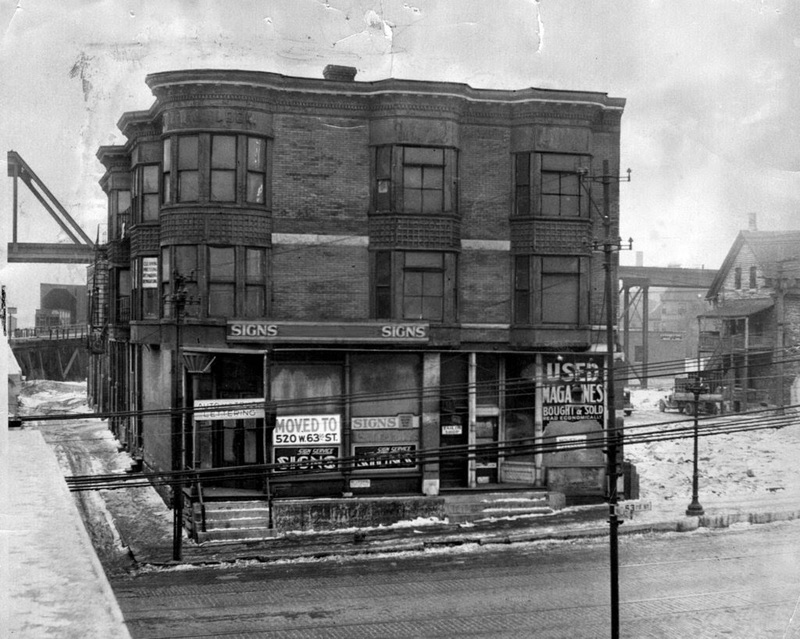 The top two floors had to be rebuilt and remodeled, but the place was still standing until the late 1930s, when it was torn down to make room for the new post office. I’ve spoken to a couple of people who still remember the place from when they were kids – the story was generally forgotten then, but people were still superstitious about the buildings. above: Adam in the “tunnel” in the post office basement while filming with the History Channel in 2012. It’s not open to visitors and Adam hasn’t been back in since! And here’s my best attempt at superimposing the castle where it would have done. So, this brings up the major question: is there anything left? Perhaps of the old foundations? 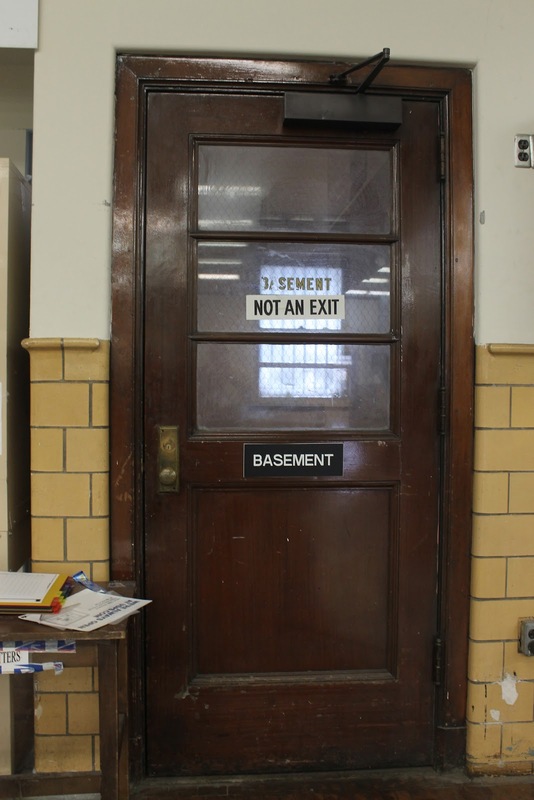 Certainly some of the basement overlaps with the original footprint. Recently, I had the chance to explore the place on a TV shoot with the History Channel. According to the post office, this was an escape hatch from the “castle.” Now, I’ve never actually seen any account of there being a tunnel down there, and no such thing was mentioned during the investigation in 1895. But these were the same investigators who found a large tank filled with gas and emitting a noxious odor, and decided to light a match to get a better look. It’s a bit west of the castle site; it’s possible the 1895 investigators could have found it if they knocked out a western wall. I sent some close-ups of the bricks to Punk Rock James, our official archaeologist, who said that the bricks look right for being from the 1890s; the lower couple of rows were probably underground foundation lays, and the upper ones show some fire damage (which is just what you want to hear if you want to imagine that these are from the castle). This portion of the tunnel is west, and probably a bit south, of the foundation, so I’d say they’re more likely from a building next door, if it’s not actually an escape hatch. So, this brings us to the big question: is the place haunted? I always say that there’s no such thing as good ghost evidence, only cool ghost evidence. But this is, as far as I know, the first cool ghost evidence ever collected at the castle site. I’m a snot-nosed skeptic about all this stuff, though. I’m even skeptical about about the castle itself – I would only say with confidence that three people were killed there. Six to eight tops, including a couple of who died off-site after being given poison there. Holmes probably only burned a couple of bodies in the castle before deciding that destroying a body in a crowded building was too much trouble and shipping them off-site to one of his “glass bending” facilities (he had a weird pre-occupation with bending glass; people eventually guessed that he was probably really using the massive furnaces he built for that purpose to get rid of bodies. He sure as hell never used them to bend any glass). I tend to think of Holmes as a swindler, first and foremost, who happened to kill people now and then, not as a regular serial killer. His suspected number of victims stood at 9-12 in his lifetime, and didn’t start inflating until about the 1940s. Nowadays it seems to go up by a hundred or so every Halloween. But as far as hauntings go, the story still checks out – a few murders are more than enough, and as long as ANY of the current building overlaps, I think it’s fair game to look for ghosts there. If you can come back from the dead, you ought to be able to make it down the hall. So, I’ll have more info for you guys eventually. In the mean time, consider one of Chicago Unbelievable’s line of Holmes-lore ebooks, or the new GHOSTS OF CHICAGO book. Our MURDER CASTLE OF HH HOLMES, a collection of eyewitness accounts, diagrams, and more primary sources has now been expanded into a full-length ebook with tons of new info – everything down to the combination to the soundproof vault! Don’t have a kindle? No problem! Get aFREE Kindle App for Your Smartphone, Tablet, or PC! And for more on Punk Rock James, there’s a whole interview with him in The Smart Aleck’s Guide to Grave Robbing, which includes everything you need to launch YOUR career as a 19th century resurrection man – the Smart Aleck way! We here at Chicago Unbelievable strongly suspect that Holmes chose to attend the University of Michigan because of its reputation as a hub for body snatching.